Africa’s research funding system has created few winners: only 2% or so of scientists from just a handful of countries and fields report receiving million-dollar grants, while almost half say they don’t receive any research funding. The big grants tend to be in fields favored by foreign funders, such as agriculture and health sciences. That’s because most research in Africa is still financed by agencies based in Europe, the United States and China, says a report published on 6 November, called The Next Generation of Scientists in Africa. The report is based on a four-year international study jointly funded by the Robert Bosch Stiftung foundation in Germany, and the International Development Research Centre, Ottawa, Canada. The report’s authors surveyed 5,700 African researchers between May 2016 and February 2017 and analyzed papers listed in the Web of Science that had African authors and was published between 2005 and 2016. The biggest funders included the European Union, the US National Institutes of Health (NIH) and the UK-based Wellcome Trust. The Bill & Melinda Gates Foundation, the German research-funding organization DFG, and the Spanish government also made the top ten. “Their role is so pervasive that if they were to pull out, research on the continent would be seriously disrupted and in most countries, it would literally grind to a halt,” says Alphonsus Neba, deputy programmes director for research support management at the African Academy of Sciences in Nairobi. Just two African funders featured in the top ten: South Africa’s research foundation and Tunisia’s science ministry (see ‘Funders of Africa’s science’). Source: The Next Generation of Scientists in Africa, 2018. Many African countries remain very heavily dependent on international support because there are very few large national funding agencies on the continent, says Johann Mouton, a co-author of the report and director of the Centre for Research on Evaluation, Science and Technology at Stellenbosch University in South Africa. Young scientists who derived more than 50% of their research monies from international sources reported receiving amounts significantly higher than the average awarded to those who received mainly national support. Overall, the scientists’ median funding over the 3 years before the survey was just US$5,000, although 128 researchers reported receiving more than $1 million. 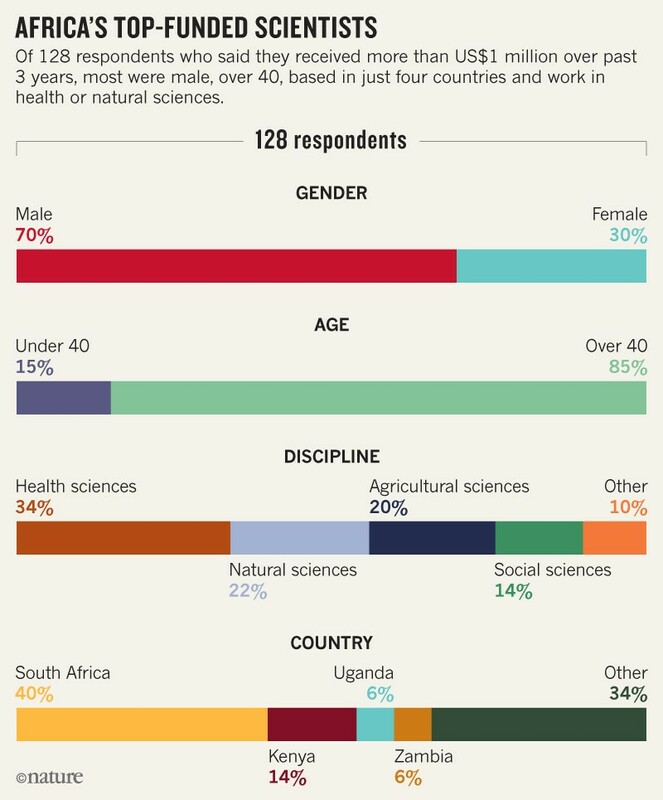 Those top-funded 128 researchers tended to be male, older than 40 and from a small subset of countries and fields (see ‘Africa’s top-funded scientists’). South Africa, Kenya, Uganda, and Zambia featured highly. They are very reliant on overseas funding, says Mouton. Scientists in the agricultural and health sciences generally have easier access to funding and to greater individual sums, the report found. Foreign financing was linked to a higher level of international collaboration. Around 95% or more of papers funded by the leading grant-makers from outside Africa were a product of such partnerships, compared with only around half of those with no foreign funding. It is not obvious if it is good or bad that there is the large presence of foreign funders, says Rodrigo Costas Comesana, a report co-author from Leiden University in the Netherlands. His team is planning to study the relationship between funding and the research topics that scientists in Africa pursue. The report also found that about 68% of the publications by African-only authors didn’t acknowledge any funding at all. This might mean that the majority of publications are not directly linked to any specific funding programme, says Costas Comesana. Overall, the report supports the notion of a ‘rising tide of African science’. African scientists have more than trebled their production of research papers from around 15,000 in 2005 to 54,000 in 2016 — with Africa’s share of the world’s scientific output reaching 3.2% — and those papers generate more citations.